More doodling and they rode into town, one of them even on a white horse. 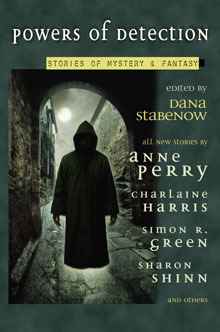 Here’s my introduction to Powers of Detection, an anthology of short stories I edited about murder in a fantasy setting. It was published by Ace in 2004, and it was a whole lot of fun. This anthology is all Laura Anne Gilman’s fault. That’s Laura Anne, always big with the subtle. I’d never written fantasy. I don’t even read that much of it, because after Middle Earth what is there? I like my speculative fiction hard, nuts-and-bolts, what happens next next door. I want to go back to the moon and on to the asteroid belt and Mars and the moons of Jupiter and from there to Beta Centauri. Sword and sorcery is a little too woo-woo for literal-minded me. But I confess, I’m afraid of Laura Anne, so I doodled around a bit, so I could say “See? I tried!” and she wouldn’t hurt me. And then these two characters showed up between the doodles. Both women. One wore a sword and the other carried a staff. They had magical powers, some of which appeared at puberty, some of which were acquired. More doodling and they rode into town, one of them even on a white horse. A young woman was strangled and by various magical means my duo discovered and brought the murderer to justice. By the time I stopped doodling I had forty-two pages, and to add insult to injury it was a sword-and-sorcery tale. It was also twenty pages too long for the anthology. Rosemary asked me to cut it to fit. I refused. I guess I thought my prose was too deathless to be tampered with. Yeah, right. So after all that, my story didn’t even make the anthology. I asked them each to contribute a story, and displaying a touching belief in my ability to get this anthology off the ground, they all did. Sharon has written a lovely little magical boarding school murder, not at all a la Harry Potter, and which she said might evolve into something a bit longer one day. Say a novel? Charlaine has written a story set in that same Sookie universe, and if there was an award for first lines her name would be on the short list. Anne takes us into the courtroom for a trial by magic, where the verdict isn’t what one might expect and neither is anything else. I remembered talking to Donna Andrews about writing speculative fiction, and she was also a contributor to The Mysterious North, so I asked her for a story, too. She sent me a delightful tale of a mage with a cold, an apprentice with a clue, and a villain with neither. Then there are the writers who live in Alaska and whom I can personally browbeat into writing for me, Michael Armstrong, John Straley, and Mike Doogan. Michael has written a modern take on an old Aleut legend involving seagulls, and there must be some kind of bird thing going on among the menfolk because John wrote a detective story from the first-person viewpoint of a raven. Mike was the only one of my contributors to weigh in on the science fiction side of murder, although I’m not sure it is murder in the end. You decide. Enjoy his character names while you’re at it. Laura Anne offered a story of her own, based on characters who inhabit a series she just sold to Harlequin Luna, and recommended I solicit stories from Anne Bishop, Simon R. Green and Jay Caselberg. Laura Anne’s story is a come-hither into a world next to but not quite of our own, seen through the eyes of a cat burglar with, yes, special powers. Anne’s story is set in the world of her Blood novels, where a vigilante wearing a jewel of power exacts deserved if harsh justice upon a serial revenge killer. Simon has written a creepy little horror-ish noir story in which Sam Spade would feel quite at home, if Sam Spade was dead. Jay brings back the ancient Egyptian gods to modern-day Cairo, with a last line that will have you all diving under your beds. I heard Roger Ebert say once that the true test of a good film was how well it sucked you into its world. Same goes for good writing. In this anthology you can smell the coffee on the streets of Cairo, walk on the ceiling with starspawn, and negotiate with extreme care the social intricacies of the world of the Blood. You can run from the raucous call of an Alaskan seagull, and you’d better. You can belly up to Sookie’s bar and order your blood at an appealing 98.6F. You can meet a gargoyle in a Savile row suit, go mano a mano with piskies, and sneeze striped bats. You can sweat out the verdict at a trial by magic, conjure a reflecting spell at the Norwitch Academy of Magic and Sorcery, and, I hope, hear the song of the Sword in Daean. Enjoy your visit to these different worlds, but watch your back. It’s not safe in here. David Eddings for a start, or Piers Anthony. Also very dangerous ground for a crime writer. Yup. Good book. I liked it. To the readers: Go read it. I’d lend it to you, but I think it’s in the archives on my kindle. To Dana: yes, you can write. Please do it some more. Thank you. Follow closely but haven’t written in a while. been pulled or am I looking in the wrong places. I promise to be among the first to buy when it becomes available. Hello again, Erma! I am in fact currently writing Silk and Song, so I took down the files on stabenow.com. Look for a Silk and Song page soon, as we are redesigning the website.